99% of all ICOs use Telegram as a channel to interact with their communities. This means that we can measure the strength of ICO communities by measuring how big these ICO Telegram groups are. Below, you’ll find the web’s most extensive list of Telegram groups for tokens and ICOs. Every 15 minutes, we track the number of members in 2000+ Telegram groups for tokens and ICOs. This is the Telegram Tracker. Think of the Telegram Tracker as giving an indication of hype: the more new members, the more hype. Below you can see the change in number of members in the last 24 hours. The graph updates every hour. You can see when it was last updated – in UTC+2 (Paris time). Would you like us to add a Telegram group? Submit your ICO here! It would be useful to have the telegram checker as a bot. Great tool, any way I could search an ICO in the list? You would need to change the format of the list from an image file to a text file. Also, the same thing but indicating the total number of users in the channel would be huge!!!! Just tell me how much you want me to pay for it! Thanks for the feedback, Josef! We’ve added the total number of users now – hope that’s helpful. And yes, we will make these graphs searchable eventually. We’ve finally added a table at the bottom so you can search through the ICOs. Thanks for the tip, Seb! We’ve added it, and we’ve also written about Quantstamp here. Great metric……… bring it on! How can i use this tracker live? This means, take these numbers with a grain of salt ! Hi, could you please add Experty.io to the list. They have support from QuantStamp(the leader in your overview). Thanks Raúl! We’ve added Experty. They’ll appear on the rankings in approx 24 hours. Hi! How come you don’t have indaHash’s information listed there. They have almost 6000 Telegram members and they haven’t even started the ICO yet! Thanks for the suggestion, Jose! We’ve added indaHash, so they’ll appear on the rankings in approx 24 hours. lol where is Electroneum? its got 28k people in the groupchat! Added! Electroneum will appear on the rankings in approx 24 hours. Done! Thanks for the suggestion. Expect numbers to show up in about 24 hours. Yeah, we had a slight technical issue – sorry about that – it will be there tomorrow morning (in about 12 hours from now). Added now. Thanks for the suggestion. Come back in about 24 hours to see Envion’s growth. Added! It’s among the 20 biggest groups. Thanks for the suggestion! You’ll see it in the growth rankings in about 24 hours. Done. In 24 hours you’ll see it. Done! Come back in 24 hours. Would be nice if you could track activity on the channel. In case of gonetwork, channel has 12k people, but it’s practically dead. I guess most are fake accounts and bots to “keep telegram hyped up” (words of their co-founder – https://twitter.com/Homocryptocus/status/936508150404009984). Zilliqa seems to be picking up steam on Telegram. Could you add it? Hey Adam! Thanks – happy you find our site useful 🙂 If you give us the URL of the group you’d like to track, we can add it for you here. can you tell me if you use a public tracking tool? Or did you create your own tracking tool? Thanks! We’ve created our own tracker. Added Spectiv now. It should show up on the rankings in 24 hours! Nice job on the stats team. Thoihgj I’m not sure if all of them are correct. For the last month or so Electroneum telegram group has been growing from 20k to now nearly 30k (as of now it is 29423 members). Why are stats showing only 13k ? We might be tracking a smaller group. Could you give us the URL to the group you’re referring to please? Thanks – added! Check back in 24 hours. Thanks! Added. Check back in 24 hours or so. Instead of providing details in the mail, why can’t you guys create a announcement channel regarding ico whitelist. Which will be more helpful and your target audience will be much more happy to see you guys in telegram. Looking forward to see you guys in telegram. Note: As i have checked i couldn’t find you guys in telegram so I thought to right up this comment. If you guys already their in telegram kindly share the link to join the channel. I think this is the link..
Electroneum has over 34,000 people in their telegram and not on here. Electroneum is currently top of the “Biggest Telegram Groups” ranking. At the moment they’re not growing fast enough to be on the “Telegram Winners Last 24H” ranking. have you thought about adding a trending feature for social media and slack? This would help to round our the Hype-o-meter. Thanks Guy! Yes, we’re currently working on a more complete community metrics tracker. Stay tuned! Where is DADI on the list? Added – check back in 24 hours for stats. Hi. Could I somehow access your API and inport it in my own spreadsheet? Hi Dino! We don’t have a public API in place at the moment. A few other people have asked us for this though, so it is something we are considering for the future. Please add Viewly – a decentralized video platform + https://t.me/viewly to the list , announcing ICO details next week , and they are also attending and speaking at the London Blockchain Conference this January . What is the correlation between Telegram group size and price appreciation, or at least probability of it going up after hitting an exchange rather than going down, like most ICOs seem to have done? Also, why do 99% of ICOs use Telegram? Isn’t that as annoying as Twitter? In the case of POWR (and a few other groups we looked at), it seemed like Telegram growth was a lagging indicator of price changes. Hoping to do a more thorough analysis at some point. You guys should follow CrowdCoinage! Looks interesting. But $100m cap…? How to get an ICO/token tracked inn icowhitelists? you got shipchain which is airdropping 250,000 coins to be divided by every telegram user. This is not indicative of a good ico. This is indicitive of insanity. So many people are going to lose a lot of money, escpecially noobs. this is a great resource to use. I got here by searching these ‘notorious’ pump in dumps that sem to move fast and quick when it comes to moving pumps for brief periods of time. This https://bitcoinexchangeguide.com/telegram-pump-dump-cryptocurrency-trading-groups-scheme/ was a good read for how some of these work but its good to see the list above of actual ICO/tokens with real communities and growing. Hi ICO whitelist, I’ve used your Telegram for a while now and has been useful, Thank you. Could you please add it to the list. Please add X8X token from X8Currency team. They have extremely good project for next version of stablecoin with fully backed up reserves (1:1) which are consisted from 8 strongest FIATs and gold. Can we use this as a bot?? Or how do we use this?? Where can we view the ICO ratings? Didn’t referum have a product before they even announced an ICO. Could a lot of the users in their chat be from that time? I love being a part of this project great project ! Please add Havven when you have a chance, we have added 5k in the last 24 hours. Done! Better late than never. Growth stats coming in 24 hours. Havven has introduced a 2nd channel as a precaution to hit 100K limit of Telegram as we are still more than 2 weeks ahead to tokensale. We operate under 2 accounts with over 102K. Havven Group #2 – being the new channel we use on our comms starting from yesterday. Could you please take both groups into account on your calculations? Can you add https://t.me/ThePayPro ? Can you add t.me/FreeRangeICO? We added 3000 members in the last few days! Hurify must be adding fake users surely? This is a very interesting analysis! It would be even more interesting to get a rating of how many of these followers are fake. It seems that some of the ICO teams are buying fake followers. Also the level of engagement would be interesting. MYOS is a really exciting new ICO thats in the process of being launched. PreICO stage is now on. I Invested in a Luxury ICO, https://newroyals.io project sounds good and the team has a record of working with the luxury industry. seems like cryptocurrency and blockchain really is the future. Could you please add BYZANTIUM | EVENTS to your list? Events.Byzantium is the first tracking platform of all blockchain events worldwide. We help you to find a conference or a meetup you are genuinely interested in. Also, we can help you to arrange your perfect one. Events.Byzantium is an endeavor by Byzantium – world’s leading agency with backgrounds in blockchain, investing, PR and marketing. Great job making this site! Could you please add Assistive Reality ARX to your list? Assistive Reality is an Australian start-up project developing Augmented Reality apps for Android, iOS, Intel smart glasses and Windows Mixed Reality, and delivering advanced multi-platform AI-integrated AR & MR software to new devices beyond 2018. Assistive Reality helps to bridge the gap between the mainstream business community and the technology-enthusiast sector that has already embraced VR and early AR technologies by bringing advanced Augmented Reality applications complete with Ethereum. The Assistive Reality ARX token sale is starting this week and the telegram group is growing rapidly. Over 2200 members have joined in the last 7 hours, making it the fastest growing Telegram Channel at this time! ACX has jumped 3000 users in the last couple hours! At RadioYo, our vision is to have an open source blockchain-based broadcasting and services platform where developers, users, hosts, service providers and advertisers can openly collaborate, track ownership of content or rewarding content creators. Hey – can you please add shivom to the list as well. They had 20k+ members in just the last day itself. Im an early investor and i love the project. Would be great to see it here. Hey, the OPEN Platform telegram group has about 45K members but isn’t on the list of largest telegram groups, any reason it isn’t listed? Hi can you add SocialCxN track? They are a fast growing telegram group with promising project. Would like to see how they grow. Can you refresh the Telegram tracker rankings? Would love to see who has moved into the rankings. Done! We had some technical issues and essentially had to re-build the tracker, but we’re back on track now. Apologies for any inconveniences caused! Hi. Yoo-mi PHA is claiming 20K followers but I don’t see them on your list. The website is http://www.ico.yoo-mi.com. Can you please check if this is accurate and add them to your list? Thanks! Auditchain TG channel has not been updated, Suppoman just mentioned them and the chat is exploding. Where is Gagapay.Network ICO? https://gagapay.network/ They got 25k Telegram members in 1 week. 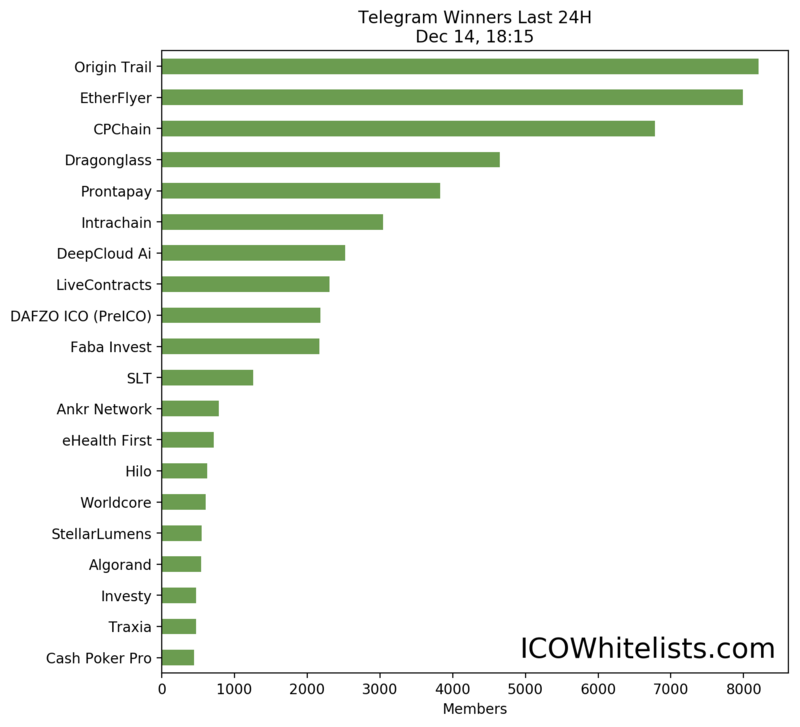 Where is Gagapay.Network ICO they have almost 25k Telegram members! Any chance you can bring back the ticker symbol? E.g. : ETH/BTC/QSP/ICO and so on? It makes it a lot easier to correlate it with other data, such as pricing data, etc. Since the naming convention can be slightly different, it makes it difficult to look things up based on the name alone – having a standard field such as ticker name would help a lot. Just like you had before. Sorry for the late response, Peter! We’ll be shipping a completely revamped version of our Telegram Tracker soon. This will also include ticker symbols. Zetochain almost has 35,000 members and isn’t on the list. Is there a reason why they (and a few other large crypto communities) aren’t on the list? You left out Quarkchain (https://t.me/quarkchainio) from the list. You left out Quarkchain (https://t.me/quarkchainio) from the list. The channel has 83,242 members as of 13 May 4:32pm (SGT).